So why guest posting? Well for a start I think that Google places weight on semantically relevant links from relevant sites in your niche. I don’t think there are many who would argue against that logic. I also think that there’s something to be said about building a clean backlink portfolio containing links from authorities and powerful sites rather than spammy links from paid posts and forum signatures. If you want to make a few quick bucks on some Made For AdSense site then you’ll probably not care too much about who links to you. But if you actually care about building a brand that will stand a chance of weathering the algorithmic shuffles we’ll see in the years to come, then building link equity from other similarly strong sites is what you need to do. And here’s why. Buy a sitewide link in the footer or sidebar of some average blog or get a link from a niche authority? I know what one I’d go for, and I know what one will count more in Google’s authority-skewed algorithm. Ideally I like to guest post on a site in the same or highly relevant niche. In an ideal world you would guest post ’10 Ways To Improve Your Surfing Skills’ on a site about surfing, but it would also work on a site about bodyboarding or windsurfing. Always try and keep your guest post as relevant as possible both to the blog where it will be placed and also to who you are linking to. What do you think looks more natural? If you were drawing up the specification for a search ranking algorithm, what type of link would score higher? In my opinion there’s no choice between a link to your site from the footer of a site in your niche surrounded by no text with links on either side to, at best, vaguely related sites with overtly commercial anchor text and a link from within contextually relevant text. There’s just no comparison. At all. Of course there’s more to building link equity than getting as many links as you can: matching up anchor text with the target URL is also very important. 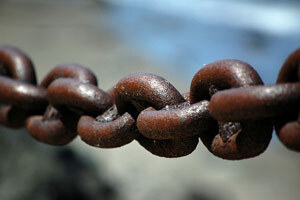 If you are buying in links either directly from a publisher or through a link brokerage then you’ll have almost complete control over your choice of anchor text. There are some brokerages with a much higher editorial standard who require you to use modifiers, but by and large the average brokerage is in it for the money and won’t stand in your way no matter what you want for anchor text. Guest posting tends to operate differently and much depends on how much trust there is between you and the site owner. Nevertheless, you should be able to get a solid targeted link from your guest post with good anchor text. One of the best things about guest posting, in my opinion, is the ability to associate your site with others in a neighborhood. Most people doing SEO now will be aware of the benefits of being in a ‘good neighbourhood’ and how it can affect your organic rankings. Guest posting is one of the best techniques to build links from authority sites and also place your link alongside links to other niche authorities. Nashville SEO services help to find the right solutions. Say you were writing a guest post on ’10 Tips For Enjoying A Trip Though Peru’ to be placed on some blog on Peru or South America, make sure you link to other posts on that domain but also throw in some links to relevant Wikipedia and WikiTravel entries as well as content on government sites and other authorities in the niche. Compare this to buying links through an unscrupulous link brokerage. In my small mind this technique hands down beats having your link placed beside contextually irrelevant links to sites of potentially dubious quality and trust who may even be in a completely different niche. Guest posts do not have to become orphaned. If you create a piece of useful content on a site in your niche that has a large readership, then that guest post stands a good chance of building secondary links. As with any blog your guest post will eventually be pushed off the front page and down the archives by fresher content. Nobody ever links to your typical paid post, but high quality guest posts on powerful sites often pick up links from other sites which means they aren’t orphaned and actually pass on power and authority. One of the best ways to get links to your content is to give the publisher a guest post or linkbait that can be pushed on social media sites. That way the publisher may get a lot of traffic, more search traffic and an increase in readership, which, let’s face it, will make it more likely you get asked to guest post in the future. One of the greatest fears of any SEO is having their site manually reviewed. If it’s easy for your competitors to reverse engineer your backlink portfolio, then you can be sure than the staff of any major search engine are adequately equipped to spot unnatural and obviously paid-for links. Integrating your link into a guest post makes it much more difficult for a search engine to devalue the power of that link. Great post! I actually just started doing some guest posts on my blog, 2 so far. If nothing else you are building a relationship with a fellow blogger, who will probably also return to your site. Is there a list anywhere with blogs that allow guest posting? I’d like to see a follow-up post on tips for landing a guest post gig. I’m just starting out and looking into the matter of posting on other blogs for all the above reasons. @Matt – exactly, it’s all about working with people and building relationships. @John – expect an email soon! @Wes – there are various services, but I find that the best way to find them is to find opportunities is approaching blogs individually. yep, and blog owners love the content… speaking of which, we’re looking for some guest posts on our site. I also want to try guest blogging but I don’t know where to start..could you guys help me where can i find the list of blogs that allow guest blogging? Get in touch with me, I’d like to talk with you about a widget I believe directly addresses points #1, #2, #5, and #7 without sacrificing quality. I wrote the widget and I’d love to get your thoughts on it, its closed invite right now. @Internet Marketing Joy – I’ll be in touch. Great stuff to consider. I’m really just getting started with the idea of blogging for PR. I think it’s right up there with Article Marketing. You still can’t beat Article Marketing for PR boosts. In case anybody is interested I would love to guest post on someone’s site as well as have some guest post on my site. I think guest posting is a major key in becoming a “name” blog. I agree wholeheartedly with the theme of this post, and have used guest-posting to great advantage. I am now in possession of several “open invitations” to guest post at various places. BTW if anyone wants to submit a guest post to Business Development in context, visit the site and use the contact form. Guests are always welcome! What is the point of doing these guest posts if the link we are leaving has the “external nofollow” tag?? GoogleBot will not count that link to our website. You guys need to focus on those blogs where the links you leave are not edited with the nofollow tag. @Johnson – I agree. If you’re purely in it for the juice and don’t care about the PR benefits as suggested by @Jeremy Day, then of course you’d much prefer a link without nofollow. But the whole point is that you should be providing a blog with such high quality content and building a relationship with bloggers where there is trust so that your links don’t get nofollowed x months down the line. A friend of mind just told me about this software after telling him all about the problems I faced with my PC. So Itried this RegDefense which I didn’t think with fix anything but suddenly right after using RegDefense I was really amazed on how faster and responding my PC was. Trying for tips about what is the cheapest teeth whitening products to use? I find it has been hard to get the right information as far as I can see. this person tells you one thing and a different place informs you something totally the opposite! So, I thought the best thing to do is get practical information from you people as you could have personal knowledge re this area. All information is really appreciated. Nice list of the benefits of guest posting. The brand recognition of building guest posts on several niche related sights is huge as well since many people read several of these blogs and then begin to remember who you are, thus building your credibility. It’s also fun to address a new community, build a relationship with another blogger, and of course, feel like you’ve made a significant contribution to the overall success of your blog through link juice. Win win all around.